The City Hall of Paterson, New Jersey designed by Carrere & Hastings c. 1896. Click HERE to see the Paterson City Hall on google street view. 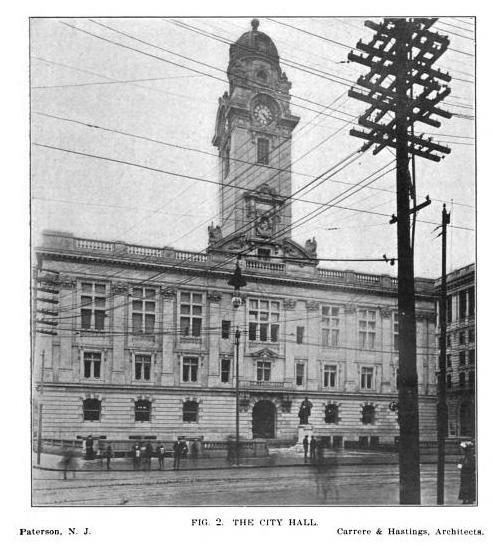 Photo from Architectural Record, 1906. A few years later, Carrere & Hastings designed a city hall for Portland Maine that combines this design with their design for the Frick. Very elegant. New Jersey has lovely buildings too - even Paterson! How about a feature on the Twombley Mansion which is now Fairleigh Dickinson (or at least it was...left the East Coast twenty years ago)? And Morristown had beautiful estates most of which survived until the early seventies only to be razed to make way for ugly buildings.